Lessons are non-rotational, so bring your partner! Try Blues & 4Beat Swing, Rockabilly, Jive, Triples, Basic Drops & Lifts and more! We teach lots of different dance styles and this is how we get to share them all. read on to the section on performance training below! 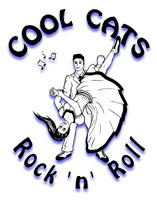 Whether it's to help support our local festivals and retro-dance events, or if you want to compete locally or across the country, Cool Cats wants to help you Take the Next Step! Join us for our training session on Wednesday nights to develop your skills and fitness. The first 30 minutes is stretching, warm-up, and core exercises, followed by an hour of dance and lift-work practice. This is a training session - not a lesson - though there will be some teaching and time for questions, critique, and guidance. Youth under 16 are free, provided they are accompanied by a parent or guardian (who does not need to participate if there is an other student happy to dance with the U16 participant), those under the age of 16 may join certain lessons FREE. Rules of conduct and style/progession restrictions apply, so please contact us for more details (principal@coolcatsrocknroll.com). If you represent a youth/student organisation, particularly if you are involved with dance or theatre, please contact us about working together to provide introductory courses and/or workshops for your members. Alternatively, if you are a member of such a group, provide proof of your current membership for a FREE introductory course. I have never danced before is that ok? Yes, its totally fine. Our classes are designed to teach you the basics as well as advanced. We love helping people learn! Comfortable clothes you can easily move in. I don't have dance shoes! it's ok, wear smooth sole shoes or socks. No, just arrive 15 minutes early. If you have an eventbrite ticket please have it available on your smart phone, alternatively a paper copy is fine. I have no Partner can I Participate? Yes, provided you are willing to work with us or one of our class assistants. However, the lessons are non-rotational so we do recommend bringing someone you are comfortable standing close too! We do our best to include our unpartnered students and find avenues for them to keep dancing.